Also known as the adventure capital of Uganda Jinja is a best option for a weekend trip outside Kampala. The site is the source of river Nile and the closet city from Kampala capital. 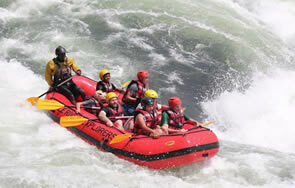 Travelers to jinja have a chance to chill at the source of the Nile and take part in different activities, which include bungee jumping; white water rafting and boat cruise among others. Jinja city is naturally blessed with a lot of tourism activities, which make it an exceptional destination for chilling. Interestingly, a variety of hotels, motels and resorts have been established to serve clients with luxury, budget and midrange food and sleeping services to travelers at affordable rates. For those who want to do shopping, there are several craft shops and shopping malls all over Jinja town and all tourism spots in the region to serve you with all you require on your weekend. If you are looking for fun outside Kampala in the shortest time possible, Mabira forest is the best spot for you. This forest is located in Buikwe district after Lugazi and before Jinja ranking as the second largest forest reserve in Uganda after Budongo forest. 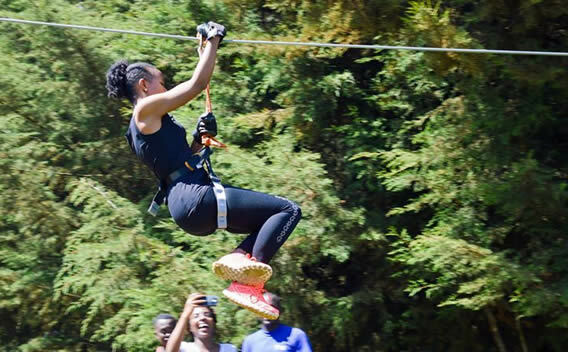 Mabira is a center for many tourism activities, which include the adventurous zip lining, forest walk, monkey trekking, mountain biking, nature walks and bird watching among others. Mabira forest is located roughly 2 hours drive from Kampala hence can be visited by short time travelers. Also Mabira forest is a home to over 218 butterflies hence the best spot for butterfly watching. Entebbe is gateway to Kampala capital city. The home to Uganda’s international airport is undeniably, calm, cool and traffic free. This makes it a best place to run to from the busy and overcrowded Kampala town. Also, the center for most beaches and resorts for sprits and relaxing know Entebbe. Among the beaches in Entebbe include lido beach, aero beach, sky beach, Imperial Beach, Lutembe beach, one love beach, Spennah beach, Botanical gardens beach, and Anderita beach among others. A lot of activities including swimming, football and swimming are done ay beaches to give clients a fresh feeling and mind. Lots of fried fresh fish and soft drinks are a sure deal at any beach in Entebbe. Stunning in the northwestern region of lake Victoria the largest fresh water body in Uganda, SSese Island is Uganda’s hidden treasure, which has presently become a best place to spend your weekend. The island is further split into several other islands roughly 84 which make it a biggest island on lake victoria. Getting to and across Ssese Island is only by boat/ ferry, which make the experience more enjoyable. A tour to Ssese island reward travelers with a fresh feeling of the unbeaten experience away from noisy congested Kampala city. The best places to stay at Ssese Island include Brovad sands lodge, PTA Androbic lodge and scorpion lodge among others. The activities that can be done at Ssese Island include sun bathing, boat cruising, horseback riding, nature walks, birding, sunset cruising and fishing among others. Also known as a chimpanzee sanctuary, Ngamba Island is yet another private place best for a weekend break and a boat cruise takes you to this beautiful site. Travelers are assured of their privacy and fun at Ngamba Island. Among the activities you will do include feeding the chimpanzees, nature walks, swimming bird watching and boat cruising which together reward you with a fresh feeling. Also, you will have a clear view of the neighboring fishing village such as Ddamba village. Interestingly, there is accommodation at the island, to serve you with excellent and comfortable food and sleeping services ensuring a peaceful stay at this beautiful island. In general, you can have a very wonderful weekend break outside Kampala. Visit the beaches, islands and other less visited tourism spots in different parts of the country, chill out and relax for a new experience.